On our recent family holiday to Los Angeles, we had a great day out at Knott's Berry Farm, one of the most visited theme parks in North America. There are plenty of rides - including impressive roller coasters, family rides and water rides - spread across several different themed areas. 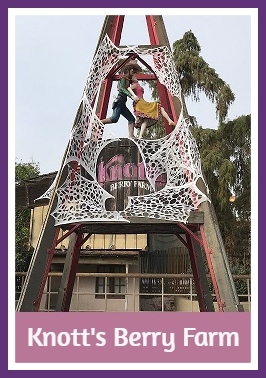 We visited the park just before Halloween, when it has been re-themed as the Knott's Scary Farm attraction. Even without staying late for the full Scary Farm experience (which is aimed at older children and adults, and looks pretty terrifying) when you visit during the day you can still enjoy the spectacular decorations throughout the park, and many of the rides have been decorated for Halloween. Lots of brilliant photo opportunities too! The beginning of the present day theme park was a replica Ghost Town, and it's still very much in evidence with lots of Wild West themed rides and attractions. Harry is a little nervous of rollercoasters so we decided to start off with something gentle - the Calico Mine Ride. This attraction was Knott's first major ride, and it takes you on a little train through the dimly lit tunnels of a working mine. It's very realistic, with a ride past underground lakes and caverns populated by over 120 characters, many of them animatronics, as you twist and turn your way along the route. We loved this one! We also loved the Western Trails Museum which is packed with all sorts of interesting things, including leaflets and maps showing how the theme park developed over time, and we enjoyed the show Mystery Lodge which has some excellent special effects as you encounter the Old Storyteller and hear his stories. Voyage to the Iron Reef was also a spectacular 3D ride with an interactive 'freeze ray' gun to shoot menacing under the sea creatures. I really loved seeing all the history in the park. It felt much more authentic knowing that the park actually once was an actual berry farm, rather than being a purpose built theme park. In the Boardwalk area you can find some of the most exciting and fastest rides in the park. We all enjoyed the tamer Sky Cabin, ascending over 180 feet for a panoramic view over Orange County and Los Angeles, before trying out some of the coasters. There are also lots of classic fairground rides here, like the Wheeler Dealer Bumper Cars and the Pacific Scrambler, as well as plenty of funfair stalls where you can win prizes and buy snacks. Camp Snoopy was where we spent most of our time. This area is filled with rides that are perfect for younger children and those that aren't keen on the more adventurous rides. Children can ride by themselves on most of these rides, giving them a bit more independence while you watch from the sidelines. Because we visited on a quiet day we very rarely had to wait and could ride over and over again. The most popular ride here with my children was Linus Launcher, where you ride around suspended face down. Harry went on it three times in a row. We also enjoyed the Grand Sierra Railroad ride which had been given a Halloween themed makeover, and the Huff and Puff ride where the children had to propel themselves around a track by pumping and pushing on their levers, lots of fun to watch! We had a really lovely day out at Knott's Berry Farm. I must admit that I was a little worried that the rides there would be too adventurous for my more timid child, but for the few rides that the rest of us wanted to ride he was easily able to wait for us at the exit, and we found plenty to do that we could all enjoy as a family. I'd definitely recommend a visit if you are in the area! 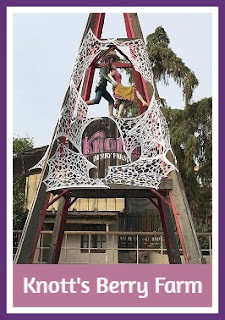 We were provided with complimentary entry to Knott's Berry Farm in exchange for sharing our day on my blog and social media.